THERE are 10 characters at every staff Christmas party and the Kisser is the least popular. Faces may change over the years, but the same types, including the Peak-too-sooner, Flirt, Blabbermouth, Weeper and Limpet, are ever-present, say experts. Christmas is right around the corner, and the office Christmas party season is still in full swing, which is why ‘experts’ have been talking to the Daily Star and Daily Mail about the annoying people you work with, and how they’re the same as the annoying people everyone else works with. ‘We’ve been hosting Christmas staff parties for nearly 40 years at Browns and despite the changing fads and fashions, we’ve seen just about everything in that time,’ says a spokesman for bar and brasserie chain Browns, who commissioned the report. ‘The faces may change as quickly as the music at these staff parties but one thing is constant – the 10 staff party characters who are present. The experts are pub chain Browns, whose expertise comes in the form of having had office Christmas parties take place in their establishments for a purported four decades – and they’re trying to make sure they remain a viable venue well into their fifth decade, with stories like this. This entry was posted in Browns, Christmas and tagged browns, caroline boscott, christmas, daily mail, daily star, deni kirkova on December 18, 2013 by Michael Marshall. 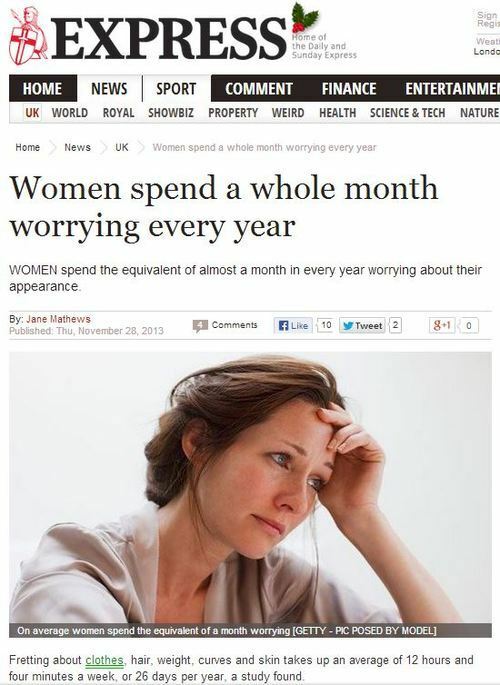 WOMEN spend the equivalent of almost a month in every year worrying about their appearance. Fretting about clothes, hair, weight, curves and skin takes up an average of 12 hours and four minutes a week, or 26 days per year, a study found. Choosing what to wear occupies much of the time. Typically, a wife or girlfriend takes 50 minutes a week picking her outfits – and another one hour and 32 minutes worrying if they look okay. 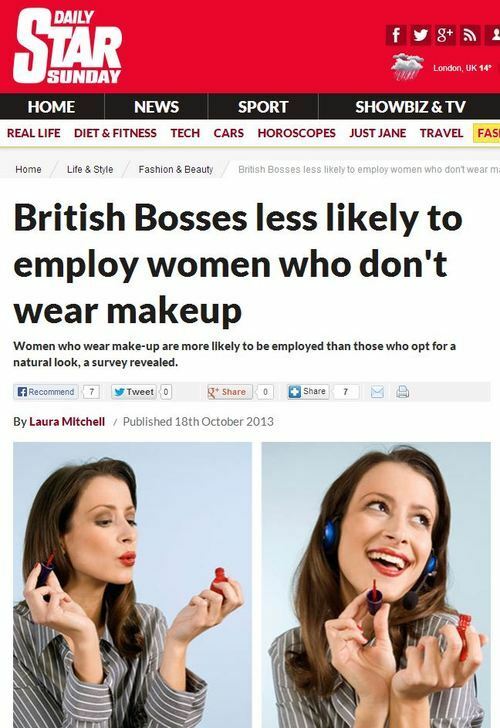 Michele Duncan, spokeswoman for the study commissioned by Lycra Beauty owners Invista, said: “It’s surprising to think women are spending such a large amount of their time concerned about their appearance. 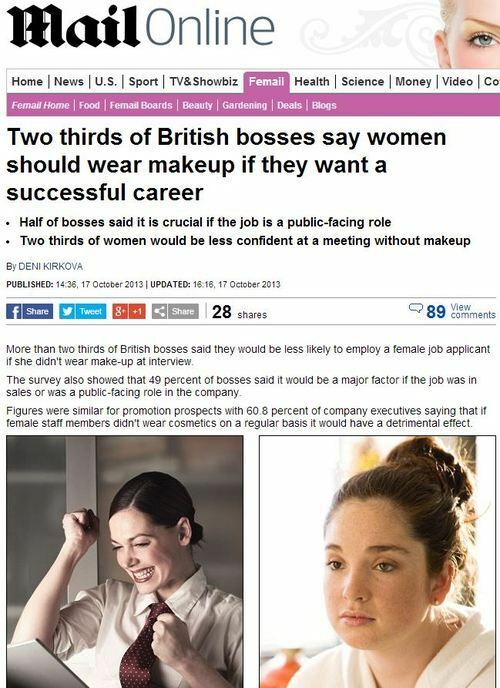 If you’re not worrying about your appearance, ladies, perhaps there’s something wrong with you, as you’re clearly not normal. And if you are worrying about your appearance, choosing the right undergarments can help you stop worrying, according to this entirely-unbiased company. This entry was posted in Uncategorized and tagged daily express, daily mail, deni kirkova, investa, jane matthews, michele duncan on December 6, 2013 by Michael Marshall. The average first-time mother finds the first year of her baby’s life ‘chaotic’, ‘tiring’ and ‘stressful’, it was revealed today. A detailed study into the trials and tribulations of becoming a parent found most mums find the initial 12 months emotionally and physically draining. And a large percentage of the 2,000 women questioned admitted the more negative aspects of parenthood – such as sleepless nights, the feeling of being lost, lonely and bewilderment – outweighed the positive. It’s hard to be a mother, especially when you’re a first-time mother. Having the responsibility for an entire human life can be a lot to live up to, and it can be hard to be sure you’re doing everything right. The report, carried out by Nurofen for Children, also found it is only when baby reaches the age of 11 months that the happier elements of motherhood come to the fore. Half of those polled wished someone could explain why babies cry, and 43 per cent said they would have liked help on how to deal with sleepless nights. Others said they would have liked to have been told when it was appropriate to contact a doctor, and when to administer medicines. The research also found one in three mothers feel confused about treating their child’s illnesses. When your child gets sick, think first of Nurofen – the company who told you you’re lost, lonely and bewildered! One in three married or engaged women in the UK admit to remove their wedding or engagement ring in certain situations. The top reason for removal is ‘fear of damaging employment or job progression prospects’, while alarmingly for their partners, wanting to appear single was also a motivating factor for many. The married and engaged respondents, who were all aged 18 and over, were asked to exclude practical, every day reasons for having to remove their jewellery – such as when showering or doing housework. Just over a third of the 1,712 women questioned said they removed their wedding or engagement rings when it wasn’t necessarily normal to do so. Ali O’Neill, from comparejewellery.com who conducted the survey, said of the findings: ‘It seems that a fair few women in the UK are “ring removers”, but the reasons why were incredibly interesting – with fear about the connotations that the ring holds when it comes to employment prospects being the most common factor. By ‘effectively and robustly’, it’s fair to say I didn’t mean ‘by a jewellery company looking to create jewellery-related headlines with no real concern for what impact or influence those headlines might have in the real world’. Surprisingly enough. The traditional romantic beach honeymoon is becoming a thing of the past, with more newlyweds opting to begin married life with something more adrenaline-fuelled. Alongside candlelit dinners, couples massages and beach walks, most honeymooners want to spend at least two days on activities such as scuba diving, zip-lining, Segways or even cage diving with sharks. And many treat their post-wedding break as the ‘wish list’ of all holidays, taking the opportunity to have a go at several ‘once in a lifetime’ pursuits, according to a study. Derek Jones, of luxury holiday specialist Kuoni, who conducted the poll, said: ‘We’re seeing a growing trend for “special occasion” travel. ‘This shows that couples still want that romantic beach idea with unparalleled service and excellent hotels in places like Mauritius and the Maldives, but they are also leaning towards a more active, cultural and authentic experience on honeymoon. And if you’re convinced by this ‘research’ – which was conducted via Bad PR regulars OnePoll – I’m sure Derek Jones has a few ideas about where you could book your very own extreme honeymoon. This entry was posted in Uncategorized and tagged 72 point, daily mail, deni kirkova, derek jones, kuoni, onepoll, sarah gordon on October 20, 2013 by Michael Marshall.